This is a new phenomenon, folks. From time to time, I’ll notice that Bullet has a wicked case of the hiccups. It’s not a new phenomenon as far as the pregnancies of the masses are concerned, but this is new for me. Hudson never had the hiccups – or if she did have them, it was early and before I could really tell what was going on in there. Bullet, on the other hand, gets them at least a few times a week. And they are hilarious. You can tell he’s not a fan of the hiccups. Rhythmic nudges in my belly signal that the bout has begun. Then Bullet will adjust his position, trying to allay himself of the discomfort. There is a break in the rhythm, like maybe he’s beaten them. He settles down. Then BAM. Hiccup. I wonder if I can scare the hiccups out of him, but how are you supposed to scare a baby en utero? An enthusiastic “BOO!” doesn’t seem to do the trick, I feel weird about shoving at him, and there isn’t much I can introduce to his environment in the way of a surprise. Maybe I can jump in the air? I should not be so amused by what is clearly a discomfort for my unborn son, but I just love any little development that gives me a sneak peek at his personality. He is clearly a man who enjoys his comforts and is irritated by interruptions to his peace and quiet. He takes after his father in this regard. This pregnancy has been so similar to my pregnancy with Hudson that I’ve been really latching on to any differences I can identify. The disdain for cheese early on. The more aggressive movements (especially directed at my internal organs). And now, the hiccups. As we enter the realm of the “single digits to Bullet” countdown, I’m certainly not taking for granted these bonding moments with my son. But I really can’t wait to see his facial expression the first time he’s fighting a case of the hiccups outside of me. I’ll try to scare the hiccups out of him then. Get her nickname right, people. So I’m glad that kind of qualified traffic is ending up here. As I’ve mentioned here before, finding meaningful ways to memorialize Hudson’s life has become a constant part of my day-to-day. Running in Hudson’s honor, the necklace I wear daily with her name on it, the Red Sox sock that is hung from my rearview mirror… all are my little reminders of Hudson and how profoundly she has changed my life. The Hubs has his ways to keep Hudson top of mind as well, the most prominent of which is the Hudson Ruth Walter Memorial Beard. Mr. Whiskers is growing out his beard until we have another baby. 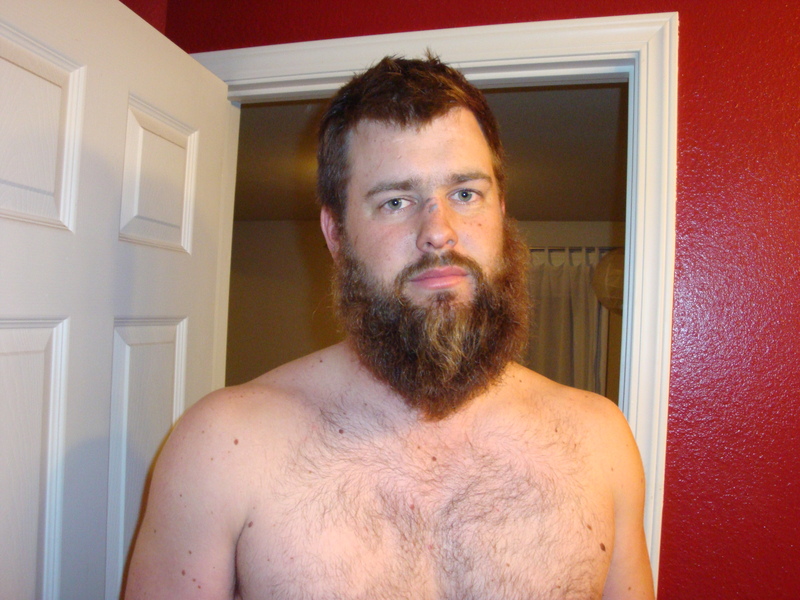 This means that my husband will have a beard of Biblical proportions when he holds our next child for the first time. And I’m cool with that. A few years ago, the Hubs half-jokingly told our then-to-be-sister-in-law that he was growing out the beard until their wedding. He stuck it out, and thus, Moses was born. This picture you’re seeing is after a mere 6-ish months of grow-out. Can you imagine what a year+ is going to look like? To keep things from getting too gross, the Hubs researched beard-growing supplements (I’m not kidding) and went to Andy’s Market post-haste to purchase Biotin, B-12 and Flax for Omega-3s. I offered him some prenatal vitamins but he refused, as he has some weird idea that taking a prenatal vitamin will give him boobies or something. Implying that I might find the Hubs exponentially less-attractive in correlation to the amount of roughage on his sweet face. This isn’t a joke-beard like “Moses” was. And the Hubs got pretty attached to that one. As meaningful as a beard could possibly be, that’s what this beard is going to be. And if nothing else, the longer and more Biblical the HRWMemBeard gets, the more incentive there will be to get Hudson’s Baby Bro or Sis on the way. The picture above was taken the night that the Hubs decided to do away with “Moses.” I was kind of sad to see it go. The Hubs joked about saving the shavings and putting them in a pillow as a wedding gift for his brother and his new bride. I know that’s super gross, but this is coming from brothers who have actually mailed toenails to each other. The HRWMemBeard is to the Hubs what Samson’s strengthening locks were to the Biblical Hero. A little, be-strong reminder of our beautiful daughter, and of the hope we have for the future. Right there on his face. My sister is big into technology. Particularly Apple products. This is the girl who follows blogs about the new iPhone, or tells me over a beer about the new, mini iPad that is rumored to be coming out next year. Mini iPad? Isn’t that just an iPhone? All that aside, this is one tech-freak who knows her game. My sister is always in tune to the zietgiest of the tech world. She makes “early adopters” look like they’re living in the 90s, with giant brick cell phones. A few weeks ago, we did a little sister road trip and spent some time talking about Hudson, among other things. And when we were talking about Hudson, we started talking about the Baby Dub blog. And while we were talking about the Baby Dub blog, my sister said the funniest thing. That’s right folks. Our daughter has a cult-like following. And now, my uterus is going to be the center of anticipation the likes of which hasn’t been seen since the iPhone 5. I cannot wait for the next release from this ol’ uterus. I imagine that the BDD will have several cool new features (Turtle instead of hamburger? Ultrasound nerds will know what this means). I’ve heard tell that sometimes there are “Buy One, Get One” offers on releases from this particular line (heyo, two babies, one pregnancy). Baby Dub Dos could come in a different color (I heard the red is extremely limited and priceless), BDD might be bigger (or smaller) than the original. Unlike the original model, Baby Dub Dos will have a scheduled release date (scheduled C-Section, baby!). And just like the original, Baby Dub Dos will have people waiting in line overnight to get their hands on him or her. Or him AND her! Of course, the Baby Dub Dos is all rumor and speculation at this point. Nobody left the protoype for BDD in a bar. What I’m entirely sure of is this: When Baby Dub Dos arrives, it will be like that Apple ad for the iPhone 4s. But life isn’t fair, and we don’t get to have Hudson in this life. So I want to be pregnant again, and like, yesterday. Today a coworker shared this video with me. I’m talking about making a baby, baby. Singapore is calling everybody to make a baby! Well, actually it is calling all “financial stable adults in committed, long-term relationships” to make a baby. I think we might as well do our duty and get knocked up tonight. The doc said to wait 6 months, but did she know about this crisis in Singapore when she was making that recommendation? I doubt it. I just read a little more and it appears they just want people in Singapore to make babies today. My doctor is probably not going to be around for the birth of our daughter. The practice I go to has four doctors, and while I’ve seen just Dr. M for the majority of my pregnancy, in this practice it’s not a guarantee that your own doctor will deliver your baby. In my case, Dr. M is going to be on vacation next week (Due Week), so unless Baby Dub decides to be several miserable days late, it’s looking like I’m going to have to see one of the other Docs for Baby Dub’s delivery. Saw the 4th of 4 today. He was nice, informative, made a lot of jokes and small talk, commented on how cool of a name the Hubs has. I’m cool with him maybe being DownWind come Delivery Day. Of course, with just 5 days to go, I’m looking for any tips for speeding up this baby’s arrival. Doctor 4 kindly informed me that we’ll most likely come within a few days of the due date, and that I should mentally prepare myself for a late arrival. Boo. Not what I want to hear, Doctor #4. As if he sensed my displeasure, he starts throwing out some options. Thank you for leveling the awkward playing field, Mr. Dub. To be fair, I am sitting on a bouncy medicine ball as I write this, trying to coax Baby Dub to “drop.” I’ve been going for a late night walk with the Hubs. I’ve been vigorously massaging pressure points. I’ve even considered the spicy food, although that brings with it a risk-reward scenario – I could go into labor, or I could get wicked heartburn. My desperation grows with each day. It’s less about being uncomfortable and more about dying from the anticipation! Every day I wake up could be the day we meet our daughter, and the suspense is killing me! I’m even considering some soft music, candlelight and a Yankee Pot Roast. The other day, I lost the keys to my car. I made it to work with them. So somewhere between the parking lot and my office, the keys to the Dubmobile vanished. I didn’t realize it until the work day was over, and of course, I had to rifle through my 3 month collection of receipts and empty gum wrappers to realize that the keys weren’t in my purse. By 5:20 I was retracing my steps through the office, trying to think of a logical place I would have set my keys down. There was no logical place. I had left my keys at the bank. And banking hours were closed. Yes. I walked through the drive through at the bank to get the keys to my car. And I had to wait behind a couple in a red truck who were making a deposit in order to retrieve my keys. I stood in line at the drive through window at the bank. Pretty sure they don’t really like you doing that. If I was making a deposit I wouldn’t like to see a frazzled pregnant woman in my rear view while I’m handing piles of cash to the teller. This is my one use of the “Baby Brain” card. Fingers crossed the next two weeks go smoothly. A few weeks ago I started to think somewhat seriously about foregoing pain medication during labor. This isn’t a crusade I’m on, I don’t see any problems with epidurals and I certainly won’t beat myself up if I cave and get one. I had a spinal cord injury about 5 years ago, and when first consulting with my doctor she encouraged me to speak with an anesthesiologist about my injury to see if it might affect my ability to get an epidural. Good news: it doesn’t. But during my whole broken neck ordeal, I did experience the wonders of pain killing drugs and I have to say… I’m not a huge fan. Not of the numbing effect… that part’s cool. I’m just not a big fan of the loopy and out-of-it way they make me feel. I want to experience our daughter’s birth without any chance of weirdness. I also kind of want to be able to push while squatting. The closest I have come to vomiting during this pregnancy was while watching a video of a woman receiving an epidural. I had to actually lay down on the ground for a good 5 minutes to avoid passing out. Evidently, spinal cord + needle = tunnel vision for Momma Dub. Also around the time that I decided maybe I’d go natural for round 1, I experienced my first Braxton Hicks contraction. At least, I think that’s what it was. It might have been gas. I later confirmed with the Doc that what I had felt was indeed a Braxton Hicks contraction, and not a bad bout of gas. Which is good, because if I’m considering an epidural over some gas pain, we’re in big trouble. The memory of the fake contraction is fading, and I’m back to thinking seriously about skipping the epidural. The Hubs is encouraging me to keep an open mind (likely because he doesn’t want to see me in that much pain, or apologize for the loud and explicit language that I use to cope!). Let’s face it, nobody knows what to expect until they are literally in the throes of labor pain, so consider my mind open. I’ll go as far as I can without it. If that gets me a drug-free birth, great. If not, please just don’t show me the needle before you stick it in my back. That ess will gross me right out. And I think you need to be conscious to push. 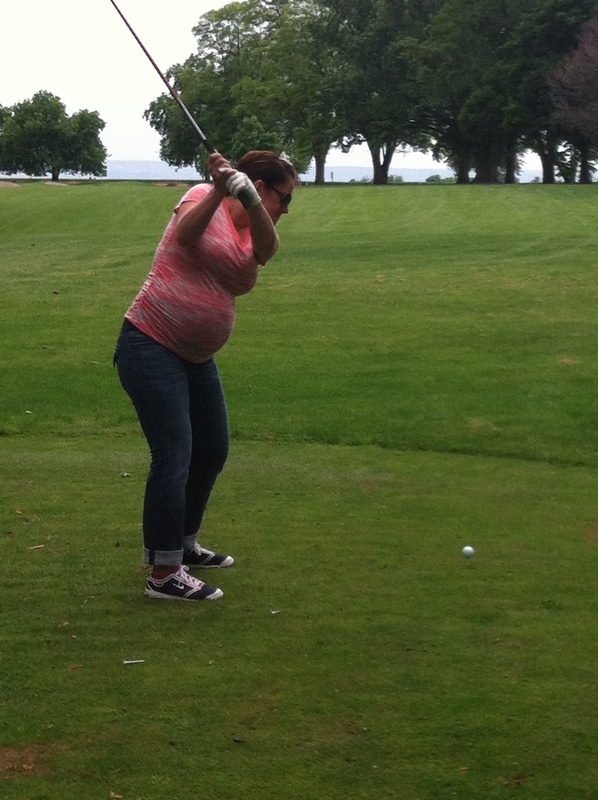 The Hubs and I went golfing today. That’s right, with one month to go til Baby Dub’s due date, and I’m walking 9, swinging driver, replacing my divots and repairing my ball marks. And just so you know, I shot a 49 on 9 holes. Not too shabby for 35 weeks pregnant. Booya. Has anybody ever golfed this pregnant? Okay, but big fat guys golf around bigger bellies than that all the time, right? Last night was our third birthing class, and it was all about managing labor pains. Last week, I was the one with the giggles in class. This week, it was the Hubs. He was red-faced and snorting practically throughout. Not only did we watch a video with lots of bra-less women moaning (a pain management technique I will try only in desperation), we followed this up with actual practice of the demonstrated techniques. Imagine a room filled with bouncy labor balls, backrub/massage devices, and fabric slings. Then imagine using these in a variety of methods. For instance, lean on a bouncy ball while your husband rubs your hips with a tennis ball. Lunge against a chair while your husband keeps the chair from moving (a position The Hubs dubbed “The Captain”). Or try “The Bobsled” – sitting on the floor with your husband straddling you from behind, with instructions to “encourage your partner to relax the perineum”. Now imagine doing all of this in a room full of strangers.